So I am making a circuit with a simple 12v dc motor in series with an NO microswitch and on off switch conntected to a dpdt switch to reverse the polarity of the motor. The first issue I had was to find a way to connect a microswitch to only work in the reverse position, and through trial and error, I connected the switch between the negative side of the battery and motor, this set up works however the batteries keep draining current (getting hot) I'd just like to ask what am I doing wrong, and is there any other method using the components used, I've attached a simple drawing (apologies for the quality). Without knowing the pinout of your DPDT switch it's difficult to say for sure, but from the image it appears you are indeed shorting out your battery through the switch. I also don't see how the microswitch is working. 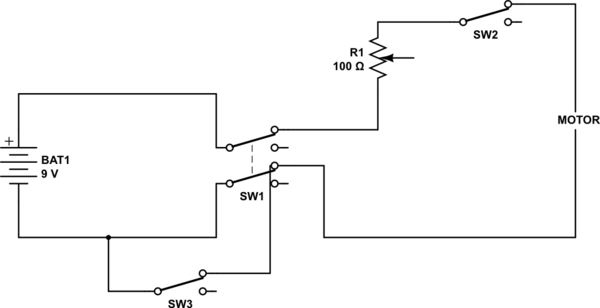 Can you try to redraw your circuit using standard schematic symbols? It will be much easier to see and understand the functionality of your current setup. Please provide some clarification of what you are trying to do with your microswitch. As described, it does not make much sense. If you intend for the motor to only run in reverse if the DPDT switch is set to "reverse" AND the microswitch is closed, then you can put the microswitch between the opposite corner terminals of the switch in the above graphic (replace one of the diagonal wires with the switch). Note that both micro switches are configured to be NC (normally closed). 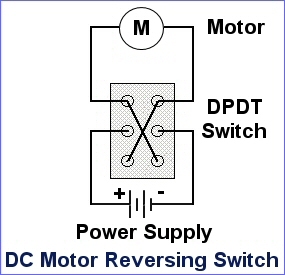 Reverse your DPDT switch to switch polarity to motor. And put your microswitch on source side of battery. Test with a meter to see if voltage changes polarity and circuit behaves as you want.